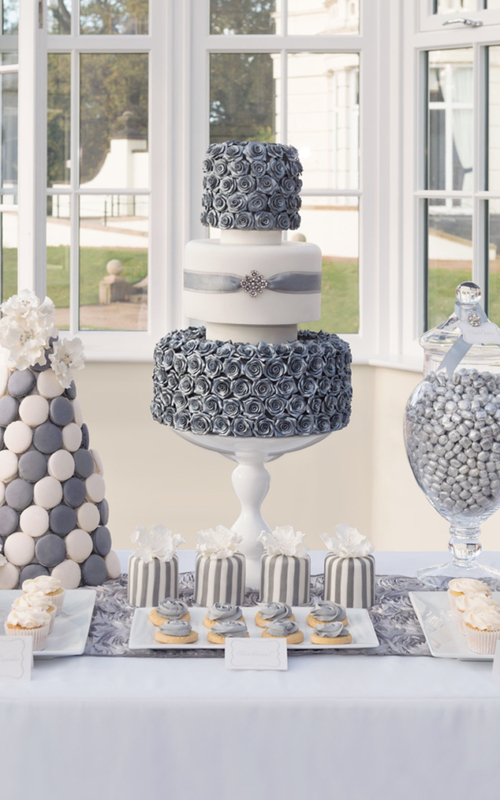 Striking 3 tier wedding cake – An opulent design with a modern glamorous touch. 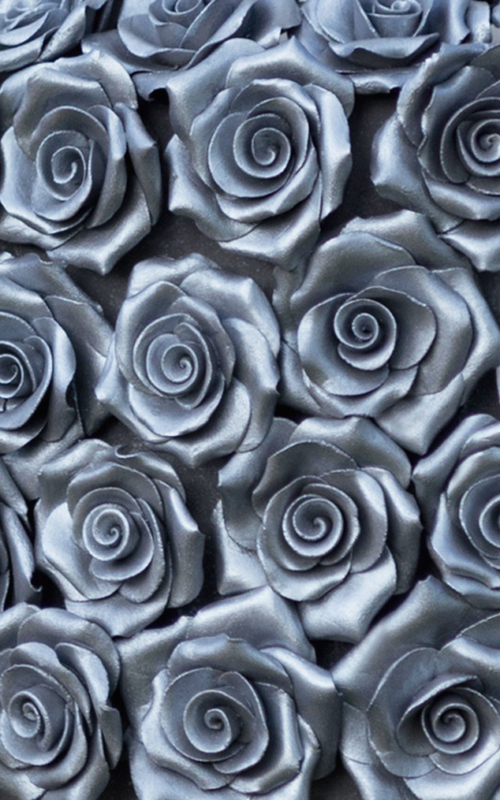 Hundreds of hand crafted sugar roses are gilded with edible silver lustre. Then intricately arranged for an extravagant finish. The cake is adorned with a vintage brooch to further enhance the design. 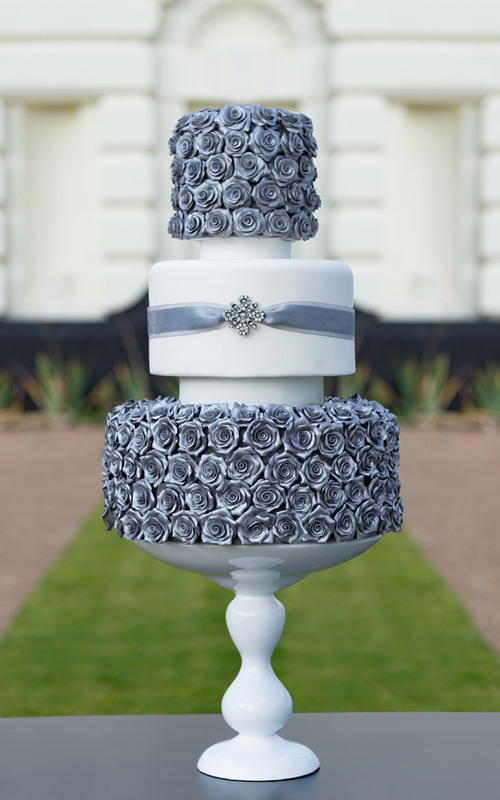 All of our wedding cakes are completely bespoke, we tailor each design to fit in perfectly with your special day. Expertly matching your style, theme and colour pallet. With a background in art and design, we pride ourselves on our attention to detail and clean, high quality presentation. We’re passionate about exceptional design, finish, and most importantly, taste. We offer a consultation to discuss your style, and any likes and dislikes you may have. We especially love to see swatches and images of anything that reflects your vision of your big day. Our consultations are also a great opportunity to sample the range of flavours and fillings we have on offer. Working closely alongside our couples we provide several design sketches, with various price and size options to choose from. Going the extra mile to ensure you have the cake of your dreams. Another great way to add some wow factor to your event is to add a customized candy buffet. With jars and platters of sweets and treats in a beautifully detailed display. However big or small we can create an impressive display everyone will enjoy. View our candy buffet gallery. In addition to our cakes we can customize a wide range of products and favours. Personalised mugs, shot glasses, champagne bottles, jars, frames and much more. Contact us for more information.